Taking part in Bangkok tours means you will literally be spoiled for choice when it comes time to grab something to eat. Not only is everything super fresh and tasty, the food is unbelievably cheap as well! Local restaurants and street stalls offer an incredible array of snacks and meals to suit every taste, and the hardest part is deciding where to start. Here are 3 of the top cheap and delicious eats in Bangkok. As a winner of CNN’s Best Eats, this popular little meeting spot continues to draw a crowd of tourists and locals alike. 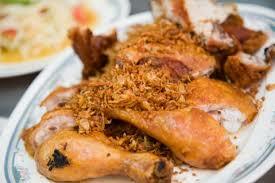 Set in Pratunam off Wireless Road, this famous establishment serves some of the world’s tastiest friend chicken. With zesty golden garlic, spicy black pepper and speciality seasonings, the sumptuous chicken is best served with over sticky rice and a plate of som tam. Just make sure that you make it in for a table before noon, as this is when all of the office workers in the area come in for lunch and it gets really packed. Another benefit of Polo Fried Chicken is that they will deliver to your hotel if you’re in the area for a very low fee. This style of chicken has become somewhat of an institution in Bangkok, and you simply must try it at least once during your stay. Situated in Bangalamphu, Roti-Mataba has earned a reputation for excellent food and efficient service that ensures that it is always busy. While the downstairs dining is narrow and quite crowded, you can escape upstairs to enjoy your meal in the air-conditioning for a more relaxed atmosphere. Roti is an unleavened whole-wheat flatbread that is then stuffed with your choice of fillings for a truly unique snack. You can choose to have chicken, beef, seafood and vegetables or a combination of ingredients to suit your tastes. 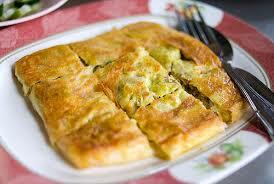 Another great option is to try roti as a sweet treat, where it is simply sweetened with thick condensed milk. The dishes are cooked on display near the door of the restaurant, and it is truly fascinating to watch the pace of the kitchen staff as they fly through each order. One of the real favourites amongst the locals is the curry chicken roti, though all flavours are recommended. The name of this great little dining spot literally means Cheap and Good, and all of the diners here can attest that it well and truly lives up to it! It is set up around a long bar counter that showcases the chefs working hard to keep up with the steady stream of orders. The selection of food is great, with many delicious fried rice dishes starting at just 40 baht. 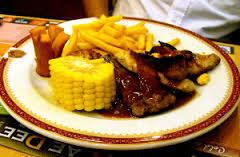 However what makes TokLae Dee such a popular destination is the incredibly cheap Western dishes that have a huge following both from locals and homesick travellers alike. You can tuck into a full American breakfast every morning before 9am for under 40 baht. With so much to choose from, the hardest part of your culinary travels through Bangkok will be deciding which delicious dish to try first! Spend some time walking through the streets and exploring the stalls for yourself, you may just find a hidden gem that hasn’t yet been discovered by other tourists. If you’re looking for the very best deals on flights and accommodation in Bangkok, make sure you check out studentflights.com.au. In addition to great prices on flights, you’ll also find great value tours and cheap holiday inspirations to help you plan your amazing experience in Thailand.